The Gazco Stockton gas stove is a traditional style stove with a quality cast iron door and heavy gauge premium steel body. The stove combines the authentic styling with the latest in living flame technology. The stove is available with either a coal or log effect fire dependent on model, with impressive heating performance that will keep a room warm on the coldest nights. The Gazco Medium Stockton has an optional remote control that allows the flame and heat levels to be changed from the comfort of your chair. 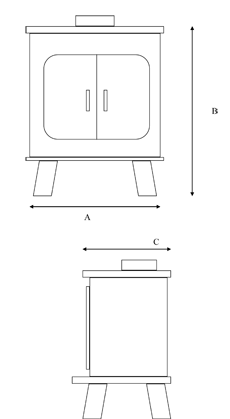 The stove contains a flue sure system and a flame failure device for safety purposes. It measures at a width of 579mm and height of 618mm, with a depth of 411mm. The heat output of the Gazco Medium Stockton gas stove ranges from 2.50kW to 5.28kW, and the heating efficiency is 78 percent with a conventional flue. The heating efficiency with a balanced flue is 82%. Very nice Gas stove looks brilliant glad we bought this. Huge gas stove with a great output. Im very pleased with my purchase.